So here you will find our contributions from the HARPO Film Productions. HARPO Studios were founded in 1989 as a follow-up of Octavia & Peter Film Production, after the family was completed with Robin, Helen, and Alex. In 1990 we made our first genuine Lego movie ('Krieg der Steine' (Brick Wars), see below). 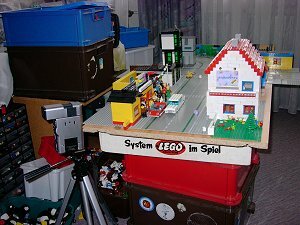 By the way, some years earlier we made another animation film on our own ('So ein Zirkus' (What a Circus), 1985), which mainly was realized with Playmobil, but contains also some sequences with DUPLO bricks and figures. Therefore, this one, too, can be considered as a Brick Film, as to this part. After our brickfilm 'Ein Koenig reich' (The King's Kingdom, 1998) was published in the internet the HARPO Studios got it's international reputation and the film was downloaded many times. So we were in charge to produce more brickfilms. This is why we made the movie 'Nicht mein Tag' (Not My Day) in early 2005 and by the end of the same year 'Von der Rolle' (By The Role). All these brick films are generally not produced for the internet, but filmed with a video camcorder and saved on VHS. Afterwards we digitalized and compressed them and prepared the films for download. Have fun! In 'Nicht mein Tag' (Not My Day) both could be seen as statists. they are the absolute stars at HARPO's. nominated for "best supporting role 2005"
Looks like all brickfilmers can't miss this subject. Actually we didn't want to show this film in this place, because it's a rather old film. We didn't have a camcorder with single frame option by that time. Therefore we filmed this Lego movie in realtime with non-visible strings etc. But our Sony Handycam was able to insert some graphic elements, which we made use of. The quality, especially in the compressed version, is rather poor. Sorry. This is the most famous HARPO movie. This film was - same as 'Nicht mein Tag' - recorded with a digital camcorder (JVC). This camera can make 3 pictures (1/8 second) in one step in the so-called animation mode. Later on the sound was added and the brickfilm was compressed and made public. A little business life movie. Two girls are dreaming of a movie star career. It doesn't work out this way, but both will take their chance anyway -- I guess. 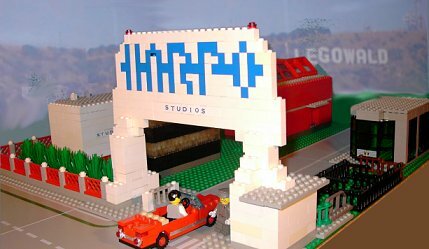 Looks like great Legowood cinema. This film leads you to the HARPO studios and contains some relations to the earlier films. Therefore you may have more fun when seeing "Ein Koenig reich" (The King's Kingsdom) and "Nicht mein Tag" (Not My Day) first. Felix and his friend stranded on a lonely island. But a man called Felix will have luck, don't he?! Question: Where does the name of HARPO come from? Answer: HARPO in connection with Helen, Alex, Robin, Peter, and Octavia was first used by Tuko from Hamburg. Now please don't ask where the name of Tuko comes from. Question: Where are the HARPO Studios? Question: In 'Von der Rolle' some scenes are strongly suggestive of the movie Casablanca. How old do we have to be to recognize this? Answer: Depends on how long it takes you to watch the original five times. Question: In 'Krieg der Steine' many names sound funny: Princess Neleh, Retep, Nibor, Xela, and Eito. Answer: Not funny but tricky. Eito is difficult, because it's a short form and should be Aivatco to be correct. Question: May I visit the HARPO Studios? Answer: Watch the movie 'Von der Rolle' and then decide whether you want it or not. Question: What about the Brick Film 'Auch nicht mein Tag' (Also Not My Day)? Answer: In our last movie we are talking about this new brick film, but in reality there are no plans yet. Question: Where else may I watch brickfilms?